I adore interesting jewelry as I design jewelry. This double ring design caught my attention for its unqiue concept, although other Maison Martin Margiela rings are quite snazzy as well. This is just my favorite. Big loose cardigan is one of my favorite fall/winter element. 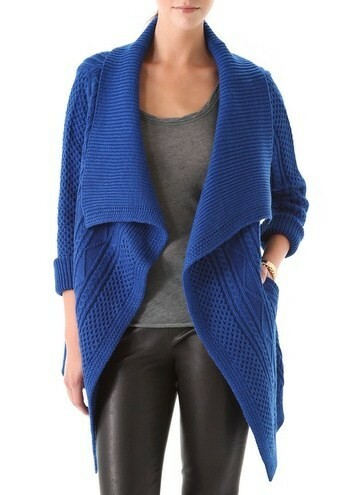 This sapphire blue open cardigan is my favorite of all the Yigal Azrouel sweaters. 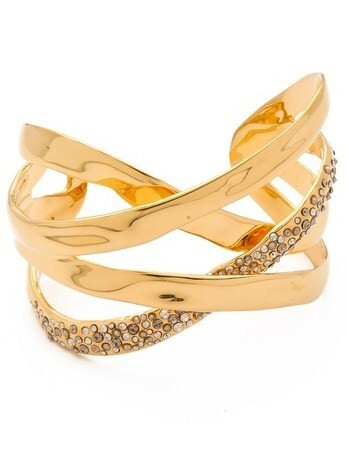 To finish the outfit, I love to have this cuff. It can be perfect day or night, casual or dressy. Gal pal first introduced me Alexis Brittar jewelry about 3 or 4 years ago and I have really liked the jewelry house ever since. So if you are the winner, what would you pick?? 1. Be a Savvy Mode Follower and a fan of Shopbop on Facebook. I'd love to get some new fall boots from Rag & Bone or Frye. Thanks for hosting. I'm a follower & fan of Shopbop on FB. Yay! 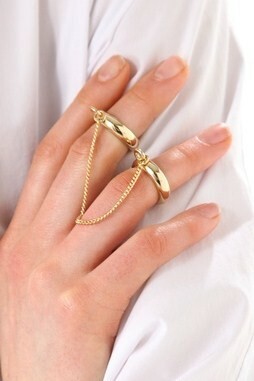 Amazing pieces and giveaway, darling ~ shopbop.com is my fave! Count me in! I've been a follower for as long as I can remember and I'm a fan of Shopbop on FB (Jessica Hamm). -I "like" both on FB. -I would put this toward a new pair of 7 for all mankind jeans. - If I won, I would get Club Monaco - Diana Dress! i am a follower and a fan of ShopBop on FB. I follow you via gfc as Dee and I like shopbop on fb as Dee G.
I follow as Laura Royal and I'm a fan of shopbop on fb too! I really need new shades so I would get Ray-Ban Mirrored Aviator Sunglasses! Love them! I follow via GFC and am a fan of Shopbop on FB. I love that MMM ring but I would probably put the gc toward a Tom Binns piece. I would have to try the DV Halle zip booties for sure. I'm a follower of Savvy Mode and like Shopbop on FB. Thanks for the chance dear - the Yigal Azrouel sweater would be divine! That ring is gorgeous, but then I love all your picks including that great cuff! I am a GFC follower and I like shopbop on facebook! I would love to get the Ray-Bans New Wayfarer Sunglasses. i love shopbop!! they have such great stuff for fall! i'm a FB fan and i follow your blog!! Ooh I would love to get the Jeffrey Campbell Cline Pumps! :) Thanks so much. I follow your blog, and like Shopbop on Facebook (Amber H). $100 to shopbop? YES PLEASE, sign me up! I would definitely be looking for something cashmere with my new giftcard. I'd get something for my new job, perhaps a nice blazer! I liked shopbop on fb. Sena S - Savvy Mode Follower and a fan of Shopbop on Facebook. hi this is a great giveaway! I follow by email. if i won, i would go for a rebecca minkoff mini mac bag. Hi, thank you for this fabolous giveaway!! I'm a Savy and Shopbop follower!